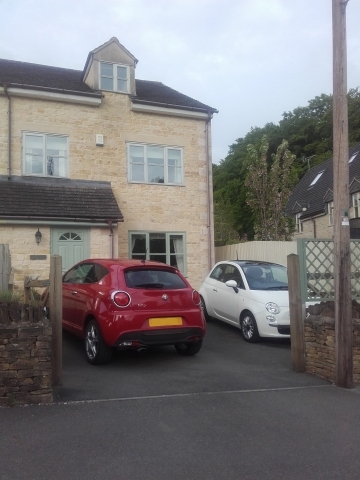 Same cars, different drive - a very different house from Plough Cottage, but not without its own charm. Firstly, apologies to our regular readers for the lack of updates, life has been more than a little hectic recently although, ultimately, we have good news to report! We moved house this week, thankfully not far from the village of Avening that we love and the new friends we have made there. It wasn't through choice, but rather unfortunate circumstances that meant the owners of the cottage in Avening changed their plans and returned at short notice. We wanted to stay in Avening ideally but, despite the efforts of friends in the village, we found nothing suitable on the market to let or to buy (although one possible purchase didn't happen due to poor timing issues) and searched for the right home within a thirty mile radius with little success. 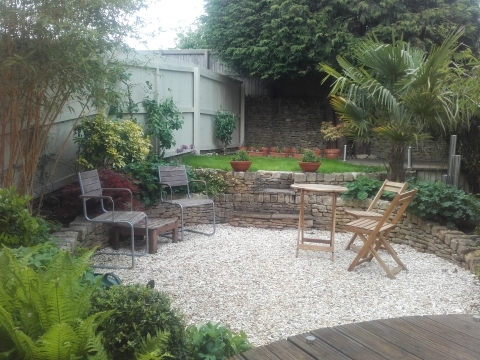 Nearly at the last minute, and thanks to the estate agent through whom we let Plough Cottage, we found a lovely house in Minchinhampton, just a couple of miles away. We will miss Avening, Star Lane and Plough Cottage. 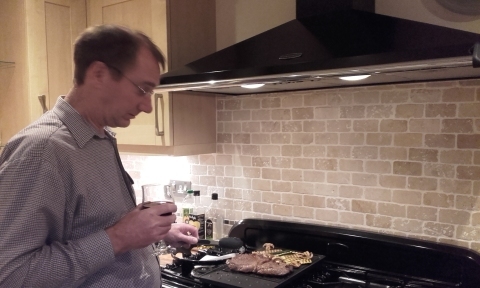 We will miss the kitchen, the utility room and the conservatory. We will miss the very low bedroom windows meaning that from bed we could look out onto the garden and watch various birds & beasts. We will miss the beautiful views from the front windows. 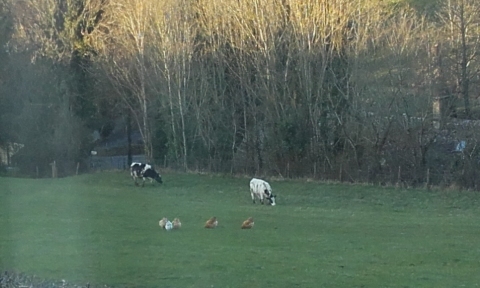 We will miss sitting at our desk and being able to look up to see John's cattle & chickens in the field. French doors from the kitchen lead out into the garden that has been beautifully landscaped with two small decked areas, two gravelled areas and a small patch of lawn. The garden is surrounded with lovely planting including bamboo, acers, clematis and an assortment of other (some yet to be identified) plants and complete with spotlighting and a nice water feature. Small but beautifully landscaped garden. Pots in the background are the tomatoes, chillies & herbs we planted. 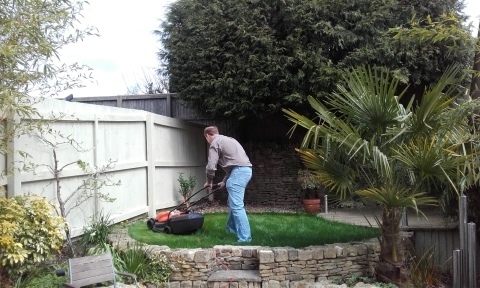 Just a small patch of lawn to mow, but Andy prefers a 'proper' petrol mower. One of the other and most exciting items of news is that I (Ann) will be taking on the role of Web Editor for the Cruising Association, working mainly from home but also travelling up to CA House in Limehouse Basin in London about once a month. It's a dream job for me in so many ways. Having gained so much from my membership of the CA during five years as a full-time liveaboard, I can now combine that experience with my IT skills to return the favour, as it were, by helping other members. During our as then unsuccessful house hunting, some much needed cheering up came in the form of an afternoon helping Matt at the Queen Matilda dig part of their back garden with a digger he'd hired. 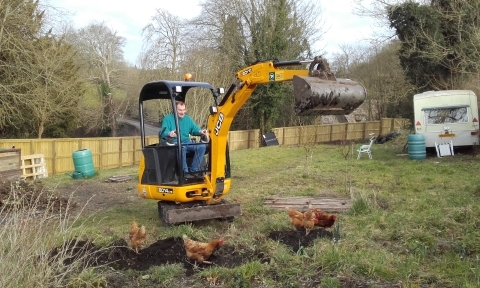 I'm not sure who enjoyed it more, Andy for being able to play work on the digger or Matt & Lynne's chickens who revelled in feasting on the worms the digger uncovered. We can assure you that no chickens were harmed during the process, but we do have to report the demise of several radishes, potatoes and leeks from the former allotment. Easter weekend brought typically quite mixed weather, although the rain and wind weren't as bad as forecast. As it was too early to start packing in earnest (in addition to Andy's resistance to the reality of having to move), we decided to relax and enjoy the Easter break. We had a couple of lovely local walks, one of which we'd not done before. Gorgeous blue skies and stunning views reminded us why we were so keen to stay in the area. Sunday roast had to be lamb of course, slow roasted with rosemary and garlic and served with boulangère potatoes, baby carrots roasted with olive oil & honey and spring peas. 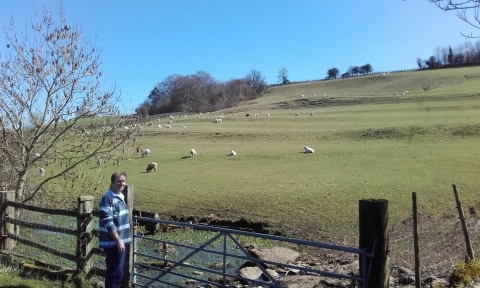 Another walk on Monday when the weather was better than forecast to work off some of the weekend's indulgences including the obligatory hot cross buns and Easter biscuits (Rowe's from Cornwall of course, courtesy of Tesco in Tetbury) completed a lovely weekend.